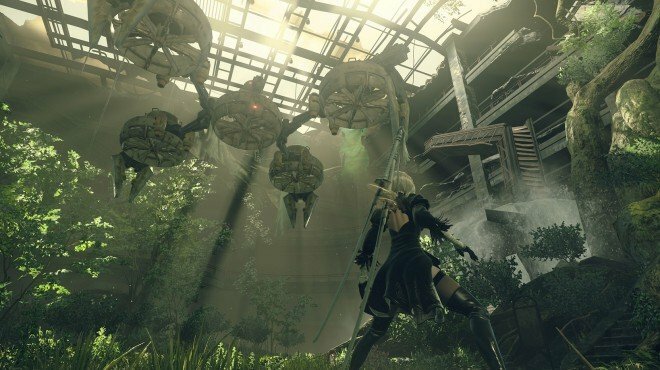 The Permanent Recluse is a Side Quest in NieR: Automata. "The former recluse's mother is troubled. As you might have guessed, her son has once again locked himself in the house, requiring 9S to hack in and save the day once more. This time, the electronic defenses are quite impressive!" "With the lock hacked and the door open, the son unhappily emerged. When asked why he sealed himself inside yet again, he insisted that he'd tried to exist in the outside world, but realized he was only happy when locked away from it. To this end, he divulged two new goals: To become the greatest, most reclusive recluse the world has ever known, and to invent a lock so formidable that none can bypass it." The quest opens up after the Assault event in City Ruins. Travel to Machine Village and go up the ladder to your right to find the "Normal Machine" with the problem. You must have completed The Recluse and The Recluse Stays Home to unlock this follow-up quest. Try talking to the son, and when it fails hack. This is a hacking attempt of destroying black blocks to progress quickly. This time there will also be attacking blocks, and harmful orange blocks. Progress quickly and shoot constantly to make it to the finish. After the hack, talk to the Son Machine once more.